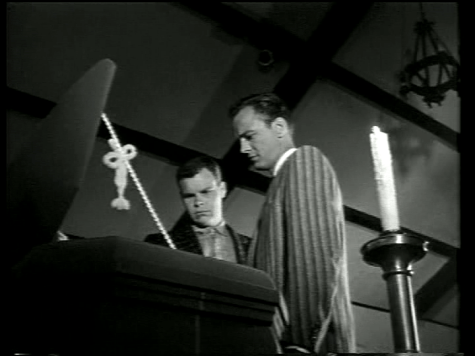 Once again, trudging through the deep sludge of the forgotten horrors, I stumble upon an unmarked grave from 1962, entitled Ring of Terror, after watching this time-waster I honestly was unsure if I would even bother reviewing, but I needed to warn others of this impending doom from files of DOA. For those readers unsure of the intention of this column, everyone states they have seen the worst horror film ever, but that statement overused and sadly one hasn’t seen the remains of films found under a ton of toxic waste, the films in The DOA Column, located under the barrel, and unable to find an ER before their demise. This time, director Clark L. Paylow, in his only directed film, using a script from Lewis Simeon and Jerrold I. Zinnamon (their only credits ever); present a cheaply made production which tallies 71-minutes all about a lame fraternity at a piss-poor medical school and element of fear one student. 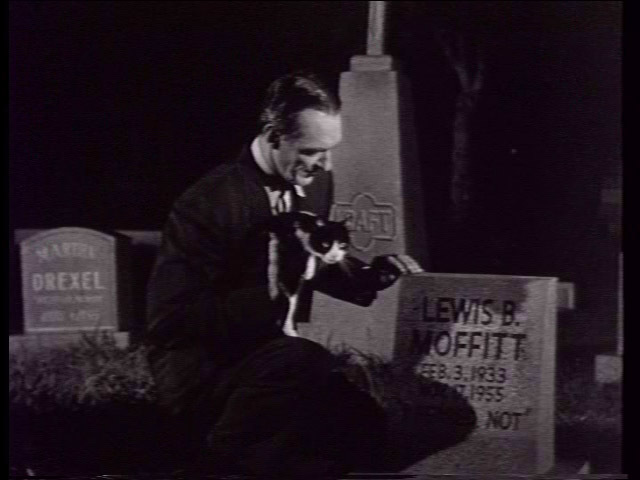 Now when a horror film tells of the victim in the first few minutes, it might be good, but when presented in a cornball silly manner, with a cat sitting near a grave with the lead character’s name on it, Lewis B. Moffitt and Rigor (Joseph Conway) teasing about the topic of fear it losing points very quickly. If you like the short version, watch the opening 2-minutes and then the last 5, or just read this review to avoid another waste of mindless entertainment. Let’s start with Moffitt, a fraternity pledge without fear but suffers from nightmares and needs a light on when he sleeps more on this later. The film builds on an unstable footing of the William Castle’s The Tingler (1959), trying to show that fear itself can be killed, no amount of bravery can stop from overpowering oneself. Castle’s film starred Vincent Price, included some cinematographer charm, and just a fun story, however this production is sluggish and dull and full of long-winded dialogue. When it breaks the talkie style occurring, it comes with insulting jokes from both students and professors all directed to an overweight couple from their dancing to dating to a so-called beauty contest. This pitiful medical school also seems quite short on corpses and because the students need to stay close so if one rolls in the students called quickly to dimly lit lecture rooms. For example, Professor Rayburn (Lomax Study), gets a call from the local morgue which got a body available for autopsy, he phones one of the students to inform them of the news. They all need to meet at the Morgue roughly in 20-minutes in order to witness, or be kicked out of school. The students leave their girlfriends at the hopping cafeteria, lucky thing everyone gathers there all of the time. The corpse contains a nifty ring on the finger. Anyway the lesson during the procedure is one of incredible scientific importance, in fact a miracle gastrovascular cavities. Especially since it only exists in jellyfish, corals and flatworms but so what, the dialogue is filled with Oh gee, golly, and golly gee. Back to Moffitt (George E. Mather, who later did visual effects on both Star Wars: Episode IV – A New Hope (1977) and Poltergeist II (1986)) while at a funeral home at night, with one candle lit (why – who knows or cares) he recalls what his nightmares actually mean. A traumatic experience, where his grandfather laid out at home and his mother told him to stop crying or the dead awake to whip him in punishment for disturbing his eternal sleep. Um okay?As the frat pranks harmless enough from playing cupid to water dump on them, to refraining from eating for a day, Moffitt gets a grave robbing task, and in lays the end of the movie, from the screech of a cat named Puma. Oh so scary! The problems in this movie, mount quickly, from too old of ‘students’ in a so-called medical school, with all one-dimension plot and characters, and then a band called The Campus Cool Cats, who do trumpet solos without a trumpeter and sax solos without the sax player actually playing. It seems everyone does something not connected to anything else, and all of it looks beyond silly and frankly very cheap. Therefore, where does this leave us, well simply another movie to avoid, the video production beyond terrible and the film itself a wretched waste of time, and beyond that the flick is actually free in the public domain. Although if you to want ruin your eyes, destroy brain cells due to boredom and waste money you could purchase the Shout Factory (2010) MST3K version. But golly gee why do that?? ?